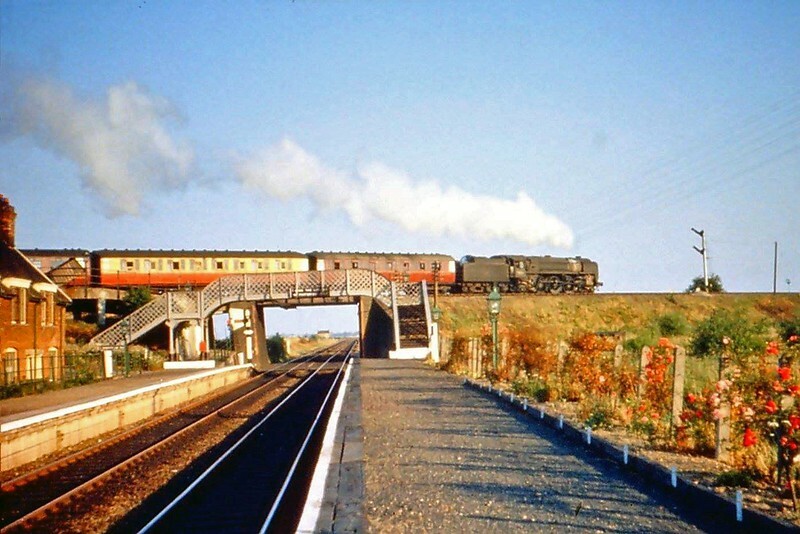 A bright sunny day in June 1959 sees Britannia Pacific 4-6-2 70007 "Coeur-De Lyon" crossing the Lowestoft to Norwich line on a Yarmouth South Town to Liverpool Street working. The photographer is standing on the Norwich bound platform of Haddiscoe Low Level station. To the left is Haddiscoe High Level station and St Olaves Swing bridge. To the right, Aldeby and Beccles. The high cost of maintain the swing bridges at St Olaves and Beccles resulted in the line closing on 2nd November 1959. Photographer unknown.